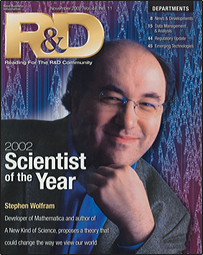 Stephen Wolfram's selection as R&D Magazine's 37th Annual Scientist of the Year follows in the tradition of past scientists making substantial contributions to the fundamental advancement of science and technology. His much-anticipated A New Kind of Science has been on the best seller lists for more than six months and has stirred scientists around the world into considering the universe from a totally different viewpoint. His Mathematica integrated environment for technical computing has more than a million users around the world from Wall Street to NASA. And the company he founded that bears his name continues to "push the envelope of technical computing." His combination of scientific, commercial, and entrepreneurial endeavors, all aimed at advancing the state of technical computing, have made lasting impressions on the R&D community and in every regard worthy of being our Scientist of the Year. The author of Mathematica created a whirlwind of scientific controversy this year when, after more than 10 years of research, he published his treatise on the ability of simple structures to create unpredictable complex patterns. The high-tech 21st century sets some pretty extreme rules on success. It's no longer adequate to just be highly intelligent to guarantee success. Similarly, excellent entrepreneurial skills by themselves rarely promise a successful career. Having the ability to innovate also is a commendable trait, but a substantial amount of effort and business savvy is also needed to transform any innovation into a successful business venture. This year's R&D Magazine Scientist of the Year, Stephen Wolfram, has combined the best of all of these traits to become one of the most respected technical minds in the world. He runs a world-class business that has left any competition it might have once had in the dust years ago, and he is at the apex of turning the scientific community upside-down with his treatise on the theory of everything (or, in his words, A New Kind of Science, or NKS). Stephen Wolfram is having a very good year, apart even from publishing his NKS and winning our Scientist of the Year award. His company has successfully transformed itself from a one-product company to a solutions-based company with the world's leading scientific software as a foundation upon which to build. That same basic product, Mathematica, has again outdistanced itself from any competition with its latest release, Version 4.2, by being faster and with Java, XML, and HTML connectivity enhancements. The number of ancillary products to Mathematica also continues to increase as its dominance in the marketplace increases and new releases make it more powerful and easier to use. A series of other major new product announcements have also been made over the past year, including web and teacher's versions of Mathematica, and a software version of NKS. CalculationCenter, introduced two years ago, continues to grow in its acceptance. Much of the growth of Mathematica, the new products, and even NKS has come about through the strength of the company that Wolfram founded in 1987. The symbiotic relationship of Mathematica and Wolfram Research was created through a combination of a strong programming staff at Wolfram Research and the continuing involvement of Wolfram in the evolution of Mathematica, new product development, and administration. Stephen Wolfram was born on Aug. 29, 1959, in London. Wolfram's father was a novelist and his mother a professor of philosophy. He attended the Dragon School, a prestigious preparatory school on the edge of Oxford University, from 1967 to 1972. It was during this period that Wolfram first took an interest in science. "I had a slight interest in the space program," he says. But that changed to a stronger interest in physics within a couple of years. Wolfram attended Eton College, UK, from 1972 to 1976 as a King's Scholar. While at Eton, he wrote and published his first scientific physics paper at age 15. In 1975 he won a scholarship to Oxford University, which he then entered the following year. While at Oxford, he worked in the Theory Division at the Rutherford Appleton Laboratory in Oxfordshire. He also wrote his second physics paper in 1976. The following year he worked in the Theoretical High Energy Physics Group at Argonne (Ill.) National Laboratory and wrote another paper on heavy quark production in quantum chromodynamics. In 1978, Wolfram moved to the California Institute of Technology in Pasadena, where he received his PhD in particle physics in 1979 at the age of 20. By this time, he had published 10 scientific papers. "Moving to Caltech from Oxford was a cultural transition—from the old world to southern California was a bit of a culture shock," says Wolfram. As such, he settled in quickly by getting involved in his studies. While at Caltech, he invented the Fox–Wolfram variables for analysis of event shapes in particle physics and discovered the Politzer–Wolfram upper bound on masses of quarks in the Standard Model. Wolfram also developed the symbolic manipulation program, or SMP, while studying at Caltech, but the school's patent rules prevented him from owning the intellectual property rights. Following his doctoral degree, Wolfram became a member of the Caltech faculty from 1980 to 1982. In 1981, he was named the youngest ever MacArthur Fellow (often referred to as the MacArthur "genius" award) from the John D. and Catherine T. MacArthur Foundation, a private grant-making institution formed by insurance industrialist John MacArthur. Wolfram was a busy individual in 1981—he also founded the Computer Mathematics Corp. (which was later merged into Inference Corp., which in turn was recently acquired by eGain Communications), the first version of SMP was released, and he began his first serious work on cellular automata, which would become a major focus of his personal research up to the current day. "I can see us very easily incorporating Mathematica into a computational biology application in the future." In 1983, Wolfram moved from Caltech to join the physics department at Princeton (N.J.) University, where he also became a member of Princeton's Institute for Advanced Study. That same year, he developed an algebraic formalism for additive cellular automata and he proposed the Wolfram Classification of cellular automata. In this system, cellular automaton rules are classified into four types according to the results of evolving the system from a disordered initial state. In the first type, evolution leads to a homogeneous state. In the second, it leads to a set of separated simple stable or periodic structures. In the third, it leads to a chaotic pattern, and in the fourth type, evolution leads to complex localized structures that are sometimes long-lived. This classification scheme was initially designated for only 1D cellular automata, but it was later extended to also include 2D automata. In 1986, Wolfram joined the University of Illinois at Urbana-Champaign (UIUC) as professor of physics, mathematics, and computer science. He also founded and became the first director of the Center for Complex Systems Research. That same year, he started development of Mathematica, which he finished 18 months later. "We had a lot of support from within the academic community from the very beginning," says Wolfram. "We had great media coverage when we introduced it on June 23, 1988. Within months, there were tens of thousands of users around the world. We didn't even run any advertisements for it until more than 18 months after we introduced it. It had that type of immediate recognition." Development of Mathematica, however, was done in the context of a corporate development, which therefore involved the founding of Wolfram Research in Champaign, Ill., in 1987. Wolfram also began publishing the journal Complex Systems that same year. "Mathematica and Wolfram Research took off very fast," says Wolfram. "We had a lot of support from the very beginning, from Sun Microsystems, IBM, and even Steve Jobs at Apple Computer." He ended his active position at the UIUC in 1988 to focus his full-time efforts on Wolfram Research and Mathematica. Within two years, there were more than 100,000 users of Mathematica and Wolfram Research was posting more than $10 million in revenues. "Things took off faster than we had expected," says Wolfram. "The educational applications made it take off very fast, and it didn't even run on a PC system at the time." At the beginning of the 1990s, Wolfram continued to build up his company and its flagship product. In 1990, he launched Wolfram Research Europe, with its headquarters near where he went to school in Oxford, UK. The following year, he released Version 2.0 of Mathematica and wrote and published the second edition of The Mathematica Book, a thick companion book to the software product. As a final supportive gesture, Wolfram undertook a 38-city international lecture tour in 1991 to spread the word about Mathematica. With Wolfram Research and Mathematica both succeeding and under control with a strong administrative staff, Wolfram decided to focus his efforts back again on research. And so began Wolfram's 11-year self-imposed scientific retreat into creating his NKS treatise. Wolfram chose to write a large treatise on his NKS, rather than a series of scientific papers because he wanted to maintain the structure of the overall concept and the only way to do that was in a monolithic book. "A lot of the value of Mathematica comes from the fact that it's a single integrated system, not just a collection of separate pieces. The same is even more true of A New Kind of Science," he says. And so for the next decade, Wolfram would write one or two chapters every year of his 12-chapter book, except for 1996 when Mathematica Version 3.0 and the third edition of The Mathematica Book were simultaneously released. Additionally, in 1994, Wolfram rounded out his international business structure by founding Wolfram Research Asia with headquarters in Tokyo. And also by 1995, the number of Mathematica users had grown to more than one million. Rounding out his biography to the present date, Wolfram completed his NKS and published it on May 14, 2002. Reams of reviews in every major media outlet known have been written about NKS and web-based chat site discussions have gone on for days. Wired magazine termed Wolfram, "the man who cracked the code to everything." ABC News called NKS "a theory of everything." The New York Times Book Review Desk called the book "a first class intellectual thrill." And slashdot.org referred to NKS as "the universe in four lines of code?" Much of Wolfram's intellectual pursuits have been in investigating complexity, cellular automata, programming, and the simplicity of computer processing to solve mathematical problems. While to some, his current situation may appear to be the culmination of nearly 40 years of education and research, I'm sure that Wolfram himself would refer to it as a beginning of a new way of looking at scientific events and proving cause-and-effect relationships. "There are lots of improvements and new applications for Mathematica," he says. "While we've just released Version 4.2, we're already in the process of mapping out the changes that will appear in Versions 6 and 7 many years from now. Version 4.2 introduced the idea of symbolic programming with the XML enhancements, but that is just the cusp of the directions that we could go into." Wolfram, ever the active CEO of his own company, still maintains a close, detailed oversight in the design and continuing development of Mathematica. "That's something that I have not yet delegated," he says. Along with his other duties and obligations, he still manages to spend more than 40 hours/week on Wolfram Research business. Wolfram Research doesn't have an exact timeline of when they will introduce the next upgrade for Mathematica. "We always wait to release a version until we've been able to put every aspect of it through our rigorous quality assurance program. We typically don't know exactly when we'll be able to release a product until very soon before the release date," says Wolfram. Some of what the programmers at Wolfram Research are working on at any given time will always be features that will not appear in released versions of Mathematica for as much as five years. One of the areas that Wolfram sees his Mathematica platform evolving into is in the area of computational biology, another technology that is just now emerging and for which the current software marketplace is cluttered and disorganized. "I can see us very easily incorporating Mathematica into a computational biology application." Not coincidentally, Wolfram is the scheduled keynote speaker at next spring's Bioinformatics Technology Conference (Feb. 4, 2003, San Diego), the heavily drug discovery and development-based LabAutomation 2003 (Feb. 5, 2003, Palm Springs, Calif.), and the Fourth International Conference on Systems Biology (Nov. 5, 2003, St. Louis). Another growth area that Wolfram sees for his company is in the area of embedding Mathematica as a component in other applications. Continuing improvements in the efficiency of its algorithms and operating system have resulted in the current release of Mathematica possessing a software footprint that is smaller than that of a word processing system. Wolfram declined to comment on any specifics of embedded applications, but did point out that Wolfram Research, in general, tends not to do joint R&D or collaborations with other companies or organizations. "We have very high standards that we set for ourselves and that tends to preclude working with outside organizations that we would not have much control over. "In some areas, we have now produced more technology than we can readily use, and we are considering the possibility of various technology spinoffs. There is some likelihood that there may be investment or purchase opportunities for these spin-offs, as perhaps in other future business initiatives that I am considering," he says. Other short-term directions that Wolfram and Wolfram Research are involved in include the development of an open problems forum—a website for the top open problems in NKS. Wolfram also hopes to implement a virtual student program that involves opportunities for qualified students to conduct supervised projects. Wolfram hopes to expand the exposure of NKS by holding focused hands-on seminars starting early next spring on basic science and applications. This would continue into a summer school for students who want to become involved with the science in NKS. The school would involve Wolfram himself and be intended primarily for graduate students and post-docs. The school is planned to consist of Wolfram lectures, distinguished guest lectures, lab sessions studying programs from the notes sections of NKS, and a discussion of general methodologies and research strategies. Additional NKS-based future initiatives would include a major multimedia course and state and college materials for teaching with NKS. Charles Darwin, on the other hand, developed and verified with his research the commonly accepted concepts of evolution and natural selection. Darwin also was an English researcher with a degree in theology. He carried out the necessary research to document that evolution has occurred in specific examples and then made the idea acceptable for scientists and the general public. Wolfram relates to both Turing and Darwin in the manner in which they developed their technologies and in how the technologies themselves relate to those that Wolfram has worked on. "If you look in my 'New Kind of Science' book, Turing is mentioned more times than any other individual," he says. Turing's integral involvement with computational techniques and artificial intelligence relates directly to much of what NKS is about, since it involves the innovative use of computational techniques to obtain its solutions. In a similar manner, while Darwin is only mentioned a few times in NKS, the science he is heavily credited with establishing—natural selection—is mentioned many times, mainly as an opposing viewpoint to Wolfram's proposals. While as Caltech, Wolfram met and worked briefly with Nobel laureate Richard Feynman. While Wolfram has a great deal of respect for Feynman in that they were both very enthusiastic about solving problems in science, they never wrote a paper together. "Our working styles were different," says Wolfram. Feynman liked to demonstrate his solutions to a problem through a series of hand calculations. Wolfram's solutions, on the other hand, most often involve elaborate computer processing techniques. So Why Does Wolfram Do Science? "I've been lucky enough to do quite a few different kinds of things, and the reason I do science is simple: I really like it. I like discovering things, and particularly I like building new intellectual structures. My business enterprises have been successful enough that I have the financial freedom to pursue whatever I want, and what I want is to do science." Wolfram enjoys challenges and most often the challenge in life is in changing things. He's been very good at changing things in his world. Changing the way that researchers do mathematics, changing the way that math is taught, changing the way that mathematics is supported to the R&D community, and just recently, changing the way that the world views science. Oh, and by the way, all of those changes have been for the better. There is no finer example of what we view as a Scientist of the Year. We congratulate Stephen Wolfram on the fine example he has set. Stephen Wolfram has spent the past 10 years researching and writing A New Kind of Science (NKS) which was released on May 14, 2002. The book is the culmination of nearly 20 years of investigation by Wolfram into the science of cellular automata and complexity, for which he published a collection of papers in 1994. The premise of NKS is that instead of describing physical phenomena with a series of complex equations and rules of natural selection, he asserts that complex phenomena can be produced by simple rules which can be easily modeled with computer codes. The fundamental engineering concept that one must always be able to foresee the outcome of the programs one writes has prevented all but a small fraction of all possible programs from being considered, according to Wolfram. Needless to say, he struck a hot button in his premise of offering an alternative view of the physical universe. NKS immediately went to the top of Amazon.com's best seller list. The book became a media sensation, hitting leading positions in most major newspapers and magazines and innumerable science-based internet chat sites. Simultaneously, Wolfram hit the media circuit, with TV and bookstore interviews. At this writing, he's also in the middle of an extended lecture tour at universities and technical society meetings from coast to coast, with a break on Oct. 16 to accept our Scientist of the Year award in Chicago. He's even scheduled to give the keynote address at this year's Comdex meeting at the end of November. In Wolfram's words, cellular automata are mathematical idealizations of physical systems in which space and time are discrete, and physical quantities take on a finite set of discrete values. In NKS, cellular automata are used to explain how complexity can be built with simple starting points, like a black- or white-colored cell. There are four types of behavior in cellular automata that Wolfram describes graphically. In the first, there's a pure repetition of the program in which a simple pattern of cells is formed with transformations in the color and size of the cell dictated by the immediately adjacent cells. The second type reveals many intricate details in cell patterns, but with an emerging regular nested structure. In the third picture, the regularity is replaced with a randomly appearing cell structure. The final picture reveals still more complex behavior with complex interacting localized structures. The enticing idea about this whole concept is that Wolfram's analysis reveals an extremely complex and completely unpredictable pattern that starts with a completely simple one-celled structure. Despite attempts from mathematical approaches like chaos theory, no fundamental explanation has been found for the randomness found in physical phenomena. NKS presents an explanation based on simple programs that predicts effects, such as repeatable randomness. Wolfram identifies 256 sets of choices or rules that can be made for the four examples of cellular automata. Of all these rules, there are 10 that exhibit an apparent randomness and only one, rule 110, whose behavior becomes partitioned into a complex mixture of regular and irregular parts. Examples of rule 110 and its implications are examined in further detail throughout the book. In NKS, Wolfram provides numerous examples of the implications of cellular automata, utilizing the strength of his Mathematica programming system and a not insignificant number of computing hours. Demonstrations include the development of snowflakes, plants and trees, and pigmentation patterns in animals. As might be expected with any radical scientific proposal, NKS has been accepted, disputed, and all sorts of variations in between. The pro-NKS reviewers acknowledge the importance of the thesis that simple systems account for complex natural phenomena. Those disputing the thesis challenge the examples presented as being unproven and "sidestepping" the issues of degrees of complexity. Wolfram Research recently released A New Kind of Science Explorer, a software version of the book that allows users to experience the computational phenomena that Wolfram describes in his book. NKS Explorer supports more than 450 experiments, each with an essentially infinite number of variations. Its computational power and interface are, not surprisingly, based on Mathematica. Stephen Wolfram spent about 18 months developing and commercializing Mathematica from the time he founded Wolfram Research to the time Version 1.0 was introduced on June 23, 1988. It was an immediate hit, with Business Week listing it as one of the 10 most important new products of the year. Now in Version 4.2, there are nearly 100 specialized commercial packages available for Mathematica, several periodicals including Wolfram Research's Mathematica Journal, and more than 200 books devoted to the system. It also has more than a million users. Spin-off products include a newly introduced web version, webMathematica, a teacher's edition, a student edition, a classroom edition, courseware, and 17 application packages from control system design to wavelet signal generation and image analysis. More than 25 additional applications have also been developed by independent developers. These include a Mathematica Link for National Instruments' LabVIEW, and specific applications focusing on machine learning, operations research, financial planning, statistics, and more. For those non-users, Mathematica is a modular software system in which the kernel that actually performs the computations is separate from the front end that handles the interactions with the user. The front end is based on interactive documents or notebooks that mix input and output with text, graphics, and palettes. The notebook front end contains menus and graphical tools for creating and reading notebook documents and for sending and receiving data from the kernel. Notebooks can be used for computational work or for publishing. The essence of Mathematica from the beginning has been its language for describing and manipulating mathematical expressions. The Mathematica language is constructed using a small, consistent set of design principles. The software incorporates a range of programming paradigms that allow users to write programs in their most natural way. Procedural, functional, rule-based, string-based, object-oriented, factorial, and mixed programming can all be written in a variety of natural ways and still be interpreted by the system. Many of Mathematica's most powerful functions actually can mix different programming paradigms. Mathematica supports 16-bit characters, contains more than 2,000 functions with numeric capabilities, an unlimited working and display precision, can operate on unlimited size matrices, and automatic and user-controlled numerical differential equation solving capabilities. While early versions of Mathematica may have been somewhat unwieldy in terms of system requirements and processing time, current versions have been vastly improved both from the continuing evolution of microprocessor and memory improvements on computer workstations and also from extensive algorithm improvements made by Wolfram Research programmers. Version 4.0 introduced in 1999, had dramatic improvements in speed and efficiency of numerical calculations, while Version 4.1 had greatly enhanced symbolic differential equation solvers, pattern matching and compiling capabilities, statistical processing speed, faster import and export filters for Excel files and tabular data, and lower memory consumption. Mathematica 4 was also the first commercial software application able to save math formulae as MathML—a new standard for math typesetting on the web. MathML is a standard established by the W3C Web consortium for presenting math typesetting on the web. Wolfram Research programmers participated in establishing this standard, which was heavily influenced by the enhanced Mathematica typesetting system introduced in Version 3.0 and its recognized popularity. The latest Version 4.2, introduced this past June, has improved linear programming and optimization capabilities, faster processing and increased robustness in many of its numerical functions, an improved simplifier, and a number of bundled packages for increased functionality. Version 4.2 now also offers support for the import, export, and symbolic manipulation of XML documents and data. Simpler programming, more functionality, and faster processing capabilities all relate to more user capabilities and an easy-to-use functionality. This relates to providing more than esoteric, high-end academic research applications. It now can be used in the more numerous "everyday" industrial applications that require reliable, increasingly sophisticated numerical solutions. The broad range of case studies provided on www.wolfram.com includes Mathematica-enabled solutions to BattleBot devices; designer clothing; automatically generated musical compositions; symbolic, numeric, graphic, and programming of biomedical procedures; surface coating characteristics for fighter aircraft; DNA sequencing; cryptography; high-energy physics; origami; risk assessment; landslide modeling; architectural design; environmental studies; and more. Financial analysis was one of the first applications of Mathematica. Major corporations, government organizations including the US Federal Reserve, and top-ranked finance schools all use Mathematica both for training and in practice. The unique financial modeling capabilities combine symbolics with advanced numerical algorithms, 3D animated visualizations, intuitive programming, and professional typesetting all within one software environment. "Mathematica is the only system that can do all of these together," says Todd Stevenson, manager of finance and economics products at Wolfram Research. Wolfram Research was founded in 1987 and its flagship product, Mathematica, was introduced the following year. For the next 12 years, the company concentrated on building and supporting Mathematica, with Version 2 released in 1991, Version 3 in 1996, and Version 4 in 1999. During this time, Mathematica established itself as the leading product in its marketplace—the company turned a profit every year since Mathematica was introduced. In 2000, Stephen Wolfram decided to take advantage of his company's technical leadership position and changed its business direction by metamorphosing into a multiproduct company offering organization-wide technical computing solutions. Conrad Wolfram, Stephen's younger brother and director of Strategic and International Development at Wolfram Research spearheaded this transformation. "We developed a great deal of unique technology that is also valuable in other contexts," says Conrad. The first product to evolve from this changeover effort was its CalculationCenter. The package was optimized for general and engineering computations that were primarily performed by spreadsheet programs and handheld calculators. This audience needed a different interface than that of the Mathematica user. The new product combined Wolfram's powerful computational abilities with a simple and intuitive user interface. It proved to be an ideal tool for researchers who need quick solutions to technical problems. The next new product introduction was webMathematica, a product for providing Mathematica's computational power over the web. This helped organizations that wanted to deliver customized technical computing capabilities either in-house or to customers through an existing web interface. A number of webMathematica applications have already been created or are in development, including a recreational website for technically oriented cyclists that takes advantage of the webMathematica engine. Other applications include products on engineering fundamentals (www.efunda.com), automated answers to common math problems (www.quickmath.com), and an online resource that provides engineers with real-world calculators (www.simplyengineering.com). These early products have resulted in a number of new partnerships for Wolfram Research. The transformation of Wolfram Research into a multiproduct-solution based company strengthened its role in its commercial application training, for which its Education Group provides about three Mathematica seminars weekly around the world, many of them in Europe. Being located near the University of Illinois at Urbana-Champaign, there always was a strong emphasis on supporting the math needs of higher level academia. Strong functional and product support for community colleges, pre-college educational institutions, and even secondary and primary schools has also been a part of the math solutions business of Wolfram Research. One of the most recent products introduced from Wolfram Research is its Mathematica Teacher's Edition. This toolkit for math teachers generates problems on the fly, so new assignments and quizzes can be created each time—or even made different for each student. The software automatically creates answer keys, provides live classroom demos, easy math typesetting, coursework, and handouts. As a highly successful purveyor of mathematical information operating in the information-rich 21st century, Wolfram Research stands out as an example to other similar companies of how to provide its product information in a user-friendly web environment. Its corporate website, www.wolfram.com, contains more than 100,000 pages of easily navigable information on Mathematica, mathematics, and science. The website includes tutorials, demos, application examples, tips, FAQs, user forums, articles, text of the past eight years of the Mathematica Journal, and even the full text of the current and past Mathematica 1,400-page manuals. The website also houses an extensive biography of Stephen Wolfram, www.stephenwolfram.com. Not to be out-commercialized, Wolfram Research also has an online store for selling its software products, a large number of in-house and outside-authored math and tutorial books, the Mathematica Journal, posters, T-shirts, coffee mugs, and more. Wolfram Research continues to maximize the value of its flagship product, Mathematica, for assisting those who need and use high-end math in their work. They now are focusing on how to use it as a foundation for the entire world of mathematics.